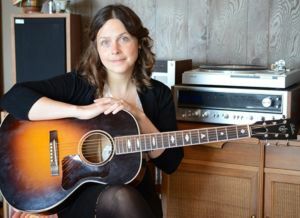 May Erlewine of Earthwork Music Collective will perform at the ISLAND Benefit. With community at the heart of their mission, it’s no surprise that ISLAND’s roots with the Earthwork Music Collective run deep. “Earthwork gets the bigger picture. It’s not just about making music. It’s about making music in community. It’s about making art in community. All of these things are tied together,” says Brad. Earthwork knows a thing or two about tying it all together. Based in Lake City Michigan, Earthwork is a metaphorical home of sorts to more than 30 bands and musicians including Seth Bernard, May Erlewine, Joshua Davis—contestant on “The Voice,” Luke Winslow King, Red Tail Ring, and Lindsay Lou & the Flatbellys to name a few. Earthwork hosts 2500+ attendees at their annual music festival called Harvest Gathering, and many of their musicians go beyond the stage to teach workshops and classes in communities throughout Michigan. This year’s ISLAND Benefit features a lineup of Earthwork musicians including Gitis Baggs, Sam Cooper, May Erlewine, Seth Bernard, and Big Dudee Roo. To follow up with Aldo Leopold—how do we live in a place without ruining it? One way to find out is to join the community conversation. Be apart of the big picture and join ISLAND to celebrate 10 years of community building in Northern Michigan—the kind of homespun building we all benefit from. Learn more about ISLAND’s programs, residencies and the Benefit here. If you can’t catch the Earthwork Music Collective at the ISLAND Benefit, save the date on April 18th for the Earthwork Collective Tour taking place at InsideOut Gallery in downtown Traverse City.